Getting from Russia to Ukraine. Most convenient and easy way to travel. Russia is Ukraines largest neigbour and the border stretching from far North to extreme South-East of Ukraine estimates almost 2500 km. Notwithstanding that most travelers head straight North to/from two Russian capitals Moscow and St-Petersburg. Both cities are well connected with major Ukrainian towns with pretty fast direct trains going from Russia to Ukraine and back. All of them stop over in Kyiv or Kharkiv and Lviv-St-Petersburg trains goes via Minsk in Belarus. Trains are for sure the most comfortable connection when going from Russia to Ukraine and back as opposed to tiring buses or super expensive planes. 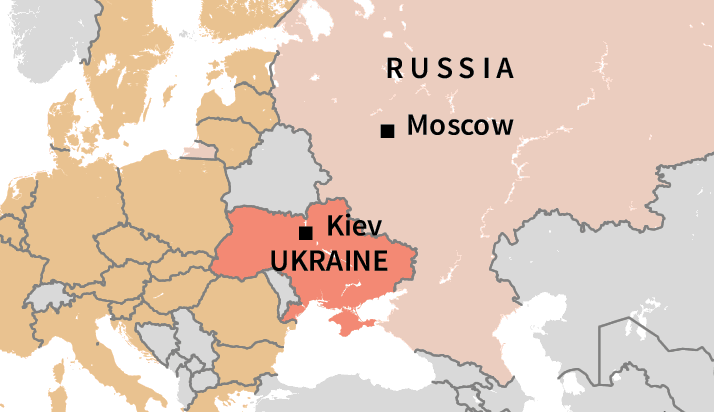 There are at least 10 daily train connections from Moscow to Kyiv and back. All trains goes to/from Moscow Kiyevskaya train station in Russian capital. Only cupe tickets are available and cost is approx. 1030 UAH (93 EUR) one way. Approx. costs for other trains are is 1030 UAH (93 EUR) cupe and 580 UAH (49 EUR) ptatzkart. Note, that you can use Kyiv as a stop-over to change for any other direction in Ukraine and then continue with cheaper fare than that one on international train. Daily train operates between two cities which takes almost 24 hours. Approx. cost is 1130 UAH (102 EUR) for cupe and 655 UAH (60 EUR) for ptatzkart. At least 4 daily direct trains operate between Lviv and Moscow. Ride take up to 24 hours and stops on the way in Kyiv. Most comfortable trains depart from Moscow at 15:48 and 22:13 arriving to Lviv at 13:56 and 20:52 respectively. From Lviv trains depart at 08:37 and 10:57 arriving to Moscow at 09:09 and 09:55 respectively. Approx. cost is 1060 UAH (95 EUR) for cupe and 607 UAH (55 EUR) for ptatzkart. From St-Petersburg train to Lviv departs on even numbered days at 12:48 arriving at 15:18 next day. Reverse from Lviv it departs also in even numbered day at 23:12 arriving at 05:22 two days after. Approx. cost is 1112 UAH (100 EUR) for cupe and 649 UAH (59 EUR) for ptatzkart. On a mid-way this train stops in Minsk, Belarus. For other trains connecting Russia and Ukraine look in Ukraine Railways web-page. Unfortunately only in Ukrainian or Russian. Find how you can navigate that web-page in Ukraine Trains page.